Nose pins have always been in fashion, It is an extremely subtle piece of jewellery; as it provides an ethnic sort of a look. If you are looking to keep it simple but still prefer sparkle; a nose rings are an apt way to go. 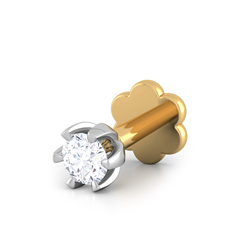 Diamonds are forever and we at Papilior agree, here you can buy designer diamond nose pins. The nose pins designs at Papilior are fashionable and tasteful at the same time. You can easily flaunt it anywhere and at any given time. This piece of jewellery is a cherry on the cake as it extends your already elegant look. You can never overdo it with an artfully designed gold nose pins. The best part about the collection at Papilior is that is it completely pocket-friendly; which makes it perfect for gifting it to someone special or even oneself.